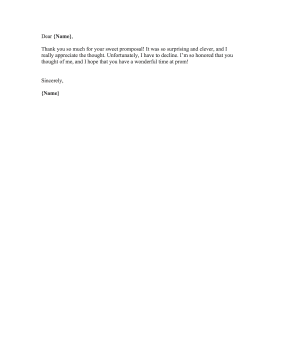 Short and gracious, this personal rejection letter turns down a promposal. Thank you so much for your sweet promposal! It was so surprising and clever, and I really appreciate the thought. Unfortunately, I have to decline. I'm so honored that you thought of me, and I hope that you have a wonderful time at prom!